Well, maybe a little more than that*, but let’s just say I didn’t buy anything new for the occasion (which has been captured in gorgeous detail by Jesse over at Raww). Although I didn’t buy anything new, my skirt does feel new! I made it from a dress that was given to me. It was quite easy, all I did was cut it off at the waist and then, to bring in the excess fabric, made two pleats that met in the centre back and gave it a little bit of a bustle. Then I just whacked on a waistband. Done! 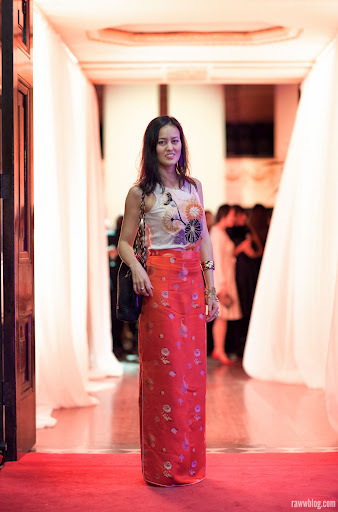 I do love the look of a cheong sam but I think I’ll get a lot more wear out of this skirt version. 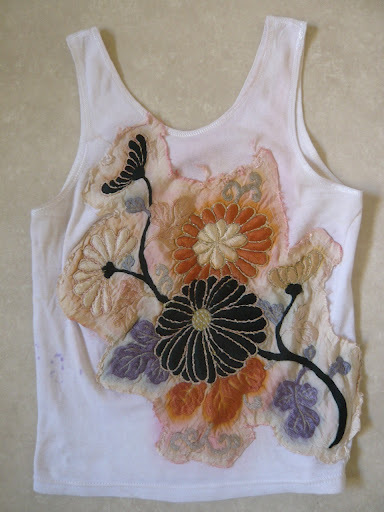 The singlet is one I made years ago from a Bonds-type thing and a piece of vintage obi fabric. All I did was stitch on the fabric… not much to tell, except that if you are stitching something on to a stretchy top, remember to stretch out the top as you sew on the applique or it won’t sit properly when you wear it! You might notice the colour has run from the obi material: kimono and obi were originally not intended to be washed, so the colour has all run. Some might see that as a fault, but I think it gives it character and a bit of a painterly look. And now, if you’ll excuse me, I must stock up on sleep for fashion week! *Skirt: $0; singlet: about $5 including obi material; shoes: originally about $40, glitter was free; Bally handbag: $8 from jumble sale; jewellery – all from flea markets or op shops, maybe about $10 or so in total? Let’s say $70 max then? It all looks fabulous – as a Brisbane fashion week attender myself, yours is one of the nicer outfits I've seen.